A regional edition for France in tribute to the most famous monument of Havana! The new regional edition Quai d'Orsay destined for France has just arrived. The name chosen by Quai d'Orsay for this cigar is Capitolio, thus paying tribute to the most famous monument of Havana. The latter housed the Cuban government from 1929 to 1959 and today hosts the Cuban Academy of Sciences. 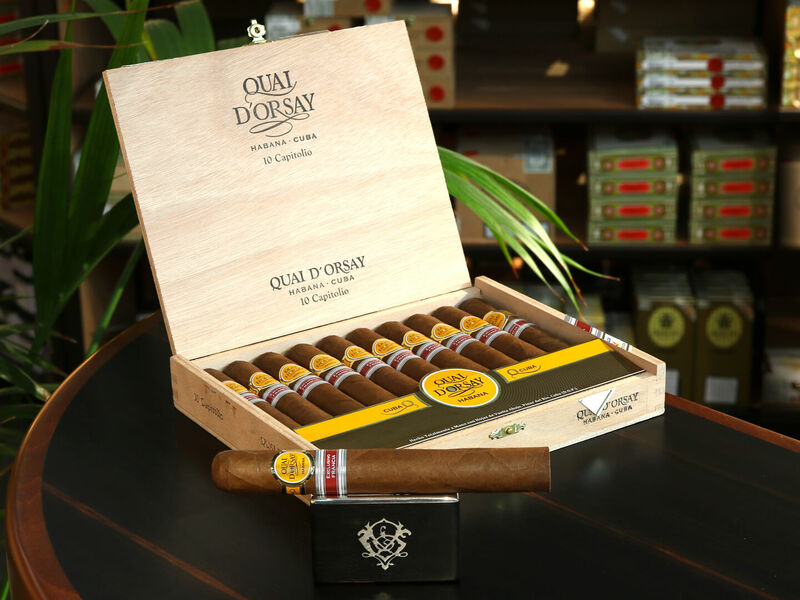 As a fifth regional edition of Quai d'Orsay for France, Capitolio follows Robusto Embajador 2011, Belicoso Royal 2013, Robusto Diplomático 2015 and Secreto Cubano 2017. The selected vitola is a double robusto. Also known as Sublimes, this very popular format has already been used for many regional editions. The production, limited to only 15'000 boxes of 10 units, comes exclusively from the factory of Partagás. Originally, the Quai d'Orsay brand was sold mainly in France. It was created in 1973 on the request of Valéry Giscard d'Estaing, at that time French Minister of Public Finances, and became President of the Republic the year after. He considered that France needed an official cigar to complement other gastronomic products of the country. The result was the cigar Quai d'Orsay, named after the famous Quai de la Seine, in Paris. This cigar was known for its lighter body and its flavour profile developed to go with French products such as champagne and foie gras. The brand Quai d'Orsay has recently gained more popularity due to the complete renewal of its range and also because it is now distributed worldwide. The current regular production now offers three different cigars: Coronas Claro, No. 50 and No. 54. As soon as we light it up, this Capitolio delivers aromas of dried fruits, sweet spices and a high quality taste. Offering a large volume of very creamy smoke, this vitola constantly evolves in the right way. The second third intensifies towards woody and rich notes, the flexibility of this mixture brings a very nice balance. Event though this cigar is very young, it still offers the scent of a stable and mature cigar. The final brings us back to reality and reminds that a few months of cellar will help this cigar reach its potential. In short, this is a cigar that is well made and worthy of its name, simply sublime!